Tires usually installed in 30 minutes or less. Peerless Tires 4 Less works with ONLY top tire brands, providing all our customers in South Dakota, Nebraska, Colorado, Kansas, New Mexico, Texas and Wyoming with the very best tires. We carry touring tires, high-performance tires, and even passenger and commercial truck tires. 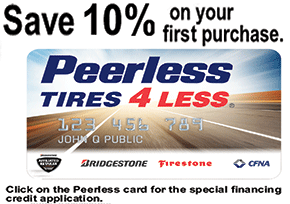 At Peerless Tires 4 Less, we make sure your car or truck has the right tires to guarantee your smooth and safe travel. A household name in America, Firestone offers a broad selection of car, truck, and sport utility vehicle tires—whether your goal is to hit your performance goals or stay roadworthy in all types of weather. Bridgestone is the largest rubber company in the world, and is known all over for products that conserve fuel and provide a smooth ride. Whether you’re behind the wheel of a Prius or a Porsche, Bridgestone has the right tire for you. You wont buy better high performance or SUV tires than Hankook. We have the best prices on the best tires—so YOU can have it all. On the job or in the field? Off-road or on the highway? Trust Delta for high quality passenger and light commercial tires. Fuzion gives you safety and confidence without a premium price, offering unbeatable deals on high performance, touring, and sport utility vehicle tires.